Listening to Patricia Baronowski, you hear a CEO in touch with every aspect of her company. You can ask her any question about the company and she will answer you without a second’s hesitation. 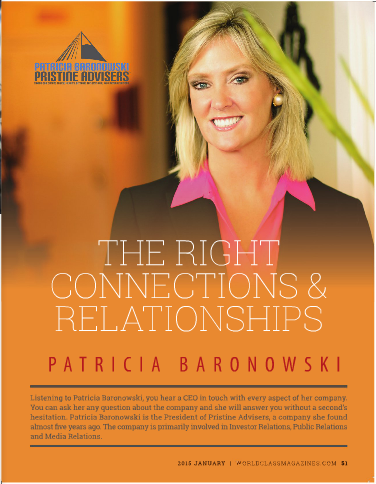 Patricia Baronowski is the President of Pristine Advisers, a company she found almost five years ago. The company is primarily involved in Investor Relations, Public Relations and Media Relations. While the company has only been in existence for half a decade, Patricia has a vast experience in Investor Relations. Her excellence in the field has contributed immensely to the reason clients have followed her wherever she has moved to work. They made it easier for her to start her own company and made up Pristine Advisers’ first clientele. Unlike most firms in this niche, Pristine Advisers has chosen to focus on a wide range of marketing services for businesses. It is quite rare to find a firm that deals with Investor Relations, Media Relations and Public Relations, all at the same time. Even those firms which deal with Investor Relations, for instance, would still be specialized in a certain aspect of Investor Relations like annual reports. Most choose to concentrate on a certain area in either of the three. Pristine Advisers’ wider scoop has given it an advantage over rival firms. Patricia believes in solving the problems of the client and would not shy away from introducing a new department in her company to try and solve a recurring issue her clients are raising. This would perhaps explain why Pristine Advisers offers website design and maintenance, webcasts and conferences. These services have been developed and incorporated in what Patricia calls a trial and error approach through the years. Today, her company is all rounded and has gained a lot of experience in these areas. If the client needs it done, Pristine Advisers will find a way to get it done. Pristine Advisers’ clients are in all shapes and sizes: from startups and small businesses to Fortune 500 companies. Patricia says marketing does not change in respect to the type or size of a business. The difference is only in the audience and messaging. This is why the company can comfortably represent a wide range of companies from all sorts of niches. The personnel at Pristine Advisers comes from a background of different types of companies making the company fully equipped to deal with most marketing challenges businesses face. Pristine Advisers has a Closed End Fund conference where companies can come and present their products to an audience of investors, analysts, brokers and the media. This initiative by the company has become quite successful with companies coming from around the world to these conferences to present their products. Pristine Advisers makes sure these conferences have a quality audience. For that reason, not every company can be allowed to participate in the CEF Network. It is not all gloom for the startups which cannot participate in the Closed End Fund Network. Pristine Advisers has other events like webcasts and podcasts that would most likely serve the needs of such a company. Patricia advises companies to constantly keep their name out there. She says it is ill-advised to cut back on marketing and advertising because there are new products being introduced everywhere every time. For any company to stay afloat, great effort has to be put in marketing. “You want to constantly keep your name out there… you’re competing for customers and clients and shareholders in a very heavily populated marketplace. So, the last thing you want to do is cut back on marketing, or cut back on the opportunity to reach these people,” Patricia says. Patricia says marketing does not have to be super expensive. Unlike in the past when there were very few marketing platforms like newspapers, magazines and television, today there are many platforms especially in the social media that are not as expensive. If you know your way around the social media, you might be able to market your products or services quite successfully without using any money. Having the right connections and relationships in the media can also save you a fortune in marketing. Patricia asserts, “You want to keep active in the space because it’s always out of sight, out of mind. So, if you’re active for the first month and then all of a sudden you disappear for three months, guess what; there’s fifty other people now in your place.” Pristine Advisers also helps with branding by bringing in an outside perspective that can help a company present itself and its brand messaging in a way the intended audience would best understand. To get in touch with Patricia Baronowski, you can send her an email at pbaronowski@pristineadvisers.com and her direct telephone line is 631-756-2486. You can also visit the company’s website at www.pristineadvisers.com for more information.